The following is a Schoolhouse Crew Review. Most of the time, my blog reviews are for things that I use with my own kids. 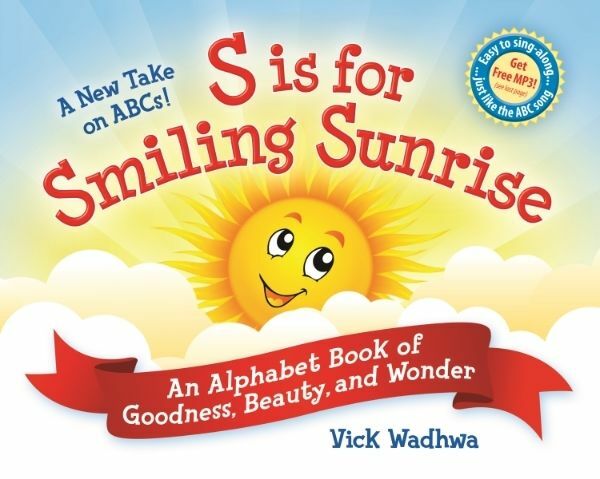 One of our Schoolhouse Review leaders suggested that S is for Smiling Sunrise: An Alphabet Book of Goodness, Beauty, and Wonder would be a fun book to share with little ones even if we just had older kids who babysat. That fit us perfectly, so even though my sweeties are all past this stage my girls do both babysit and help with younger children at church and in our homeschool co-op. WordsBright's first book is also the first book by the author Vick Wadhwa. This is indeed a different type of ABC book. For this review, we received a hardcover copy of this book as well as the accompanying teacher's guides and MP3 download. The colorful illustrations are cheerful and bright, one page per letter. Each letter has one or two corresponding words as the title suggests. In addition to S is for Smiling Sunrise, G is for Gift, Q is for Quiet times, and O is for Ocean. Each of the 26 letters of the alphabet has a different associated word than is typically found in children's ABC books. I've read "K is for King" in many books. In this book, K is for Kaleidoscope as pictured below. At the top of each page, capital and lower case block letter illustrations are featured and the prominent word is shared in large colored letters. Along with the colorful pictures and rhyming verses, a downloadable song (MP3) lets you hear the words sung accompanied by lovely piano and guitar music. Children who are already able to read can follow along as they listen. Others can learn the words by singing to the tune of the familiar ABC song. The verses beneath each letter and featured word aren't filled with additional words beginning with the same letter. Instead, the words fit the cadence of the song. At the end of the book and song, children are invited to start over. "Lets sing A to Z!" My daughter's first comment after originally reading this book was that she, too, could write a book like this. I'm encouraged that she found it so inspiring. Teacher's guides for pre-K and grades K-3 are also included which provided additional corresponding concepts, guided questions, vocabulary words from the book, and activities. Click below to read other Schoolhouse Crew reviews of this book.